Sometime in the early seventies, Dr. John C. Lilly, the inventor of the isolation tank, invited theoretical physicist Richard Feynman to float at his Malibu home. Feynman had long coveted hallucinatory experiences but feared the requisite drugs would “screw up the machine” — his Nobel Prize-winning mind. Floating seemed a safer way of inducing reverie. [Lilly] showed me the Periodic Table and made up a lot of mystic hokey-poke about different kinds of light that have different kinds of influences. He told me how you get ready to go into the tank by looking at yourself in the mirrors with your nose up against it — all kinds of wicky-wack things, all kinds of gorp. I didn’t pay attention to the gorp, but I did everything because I wanted to get into the tanks, and I also thought that perhaps such preparations might make it easier to have hallucinations. So when I’d come home I’d turn out the lights and sit in the living room in a comfortable chair, and try and try — it never worked. I’ve never been able to have a hallucination outside of the tanks. Of course I would like to have done it at home, and I don’t doubt that you could meditate and do it if you practice, but I didn’t practice. Hutchison’s Village Voice article was published in 19821. Aside from the price ($25 — less than half the going rate in 2015), a few telling lines (“floating has become the hottest mass entertainment since cruising for burgers”), and the number of centers in America (over fifty then, then, more than two hundred and fifty now), it’s the same magazine piece about float tanks that’s written and published today. The writer — almost always male, except when not — has heard a lot about floating lately. Been meaning to try it! He’s heard Joe Rogan’s endorsements. He likes feelings, likes pot, likes thinking, has meditated. He has a Burning Man-type friend who swears by the practice, and though the writer does not fall for all that wicky-wack, hokey-poke gorp, he says what the hell, why not float, why not write the next great discursive magazine piece? He arrives at the float center. He discourses on fear, his fear — of small spaces, of the dark, of himself, of becoming protohuman, of new-age music. He meets the owner/manager, who is nice — not wack at all. The facilities are impeccable. The center has been open for six months and is doing great. The music is sub-par. The writer enters the tank. Not feeling much! Has this been a big waste of time? Joe Rogan was wrong? Should have blazed before this? Unbidden, an image from early childhood floats by. Oh, so it’s that kind of experience? He reviews, in succession, all the times he’s wronged another person. It’s working — he submits to what researchers call the Relaxation Response, lists relevant studies about endorphins and stress, quotes a doctor. From the mid-eighties into the nineties, float centers declined in popularity due to unfounded fears about AIDS. The music comes on. Who knows where the time goes? He leaves the tank no more simian than he entered it. Everything feels a little stiller. He’s in that theta-wave state. Colors, scents, sounds — they’re so vivid, delicious. He bounds out the door into the sunlight. He skips down the sidewalk, eavesdropping, smelling women. Life! He pauses on the subway platform to think about what we do to each other. The writer is convinced that he and we would benefit from regular appointments at a float center. The article is prescriptive, though he does not say if he will return. Somehow, we suspect he will not. After his strange and invigorating experience in the tank, Hutchison interviewed researchers and people in the float tank industry. He was surprised by their pragmatism and lack of pretense. From these conversations, as well as hundreds of hours of floats at the same New York center, Hutchison produced The Book of Floating, a collation of everything anyone could possibly want to know about flotation REST in 1984 and perhaps in 2015. Hutchison devoted the majority of the book to different explanations of how and why floating affects people, some tenable (“The Anti-Gravity Explanation,” “The ‘Benefits of Boredom’ Explanation”) and some tenuous (“The Aquatic Ape Explanation”). While I would not characterize Hutchison’s effusions as ethereal, they do grate after a while — as an ebook it’s three hundred and thirty-six pages, many chapters built from flotsam of non-flotation-REST-specific psych studies — and though his enthusiasm seems genuine and the anecdotal evidence alone is compelling, it’s difficult to imagine the book being read in its entirety by anyone other than float center operators, float tank vendors, and diehard floaters. Gateways Books and Tapes, a small press in Nevada City, California, republished The Book of Floating in 2003. The first printing of fifteen hundred books took several years to sell out. But for the last two years, editor Ivan Lourie told me, Gateways has regularly shipped “carton quantities” — up to forty — of Hutchison’s book to “between thirty and fifty” float centers worldwide. Gateways, which carries a selection of books on spirituality, may soon have to hire someone part-time “just to ship tank books.” A new two-thousand-book printing of The Book of Floating “may not even last a year,” Lourie said. For the 2003 reissue, Hutchison wrote a new section, “The Enlightenment Explanation: Floatation as a Gateway to Pure Awareness,” that details a series of grave personal misfortunes. In February 1999, Hutchison’s house burned down. Firefighters found him unconscious amid the black smoke. He spent time in intensive care with tubes in his throat. All his writing — on hard-drives or diskettes and in manuscripts — was lost to the blaze. One night, not long after his release from the hospital, he went for a jog. As he crossed the Santa Fe River on a footbridge, he slipped on ice and fell onto rocks below. He landed on his neck. Fading out of consciousness, half-immersed in the freezing river, short of breath and unable to speak, he awaited death. Instead, he awoke prone on an operating table. Surgeons fused his five shattered vertebrae. He would be a quadriplegic, doctors told him, for the rest of his life. He lay in a body cast for three months. Twice he caught pneumonia and nearly died. Still in intensive care, terribly depressed and confused as to the “cosmic meaning,” if any, of these near-death experiences, Hutchison regained movement in his fingers, later his feet. Hospital staff moved him to the rehab ward, where he further improved his mobility. He believed his condition would continue to improve. Then he ran out of money. essentially a warehouse for terminal Alzheimer’s patients and old people waiting to die. Many of them just lined the hallways sitting all day like vegetables in wheelchairs. Many others were constantly screaming and wandering up-and-down the hallways and sometimes would even wander into my room and climb in bed with me and at times urinate and defecate in my bed. This was frustrating to me since I couldn’t move enough to get them out of my bed or room. La Residencia closed in 2003 and became a Drury Plaza Hotel. Internet searches for the nursing home lead to ghost-hunting websites, which seem to have sourced their stories from the popular manual Haunted Places: The National Directory (2002). The book claims a long-dead little boy cried in room 311, and that a basement wall oozed blood. The dismal quarters caused Hutchison to consider his near-death experiences with newfound urgency. He realized he needed to stop trying to control his life, an insight he credited to meditation, which he studied for many years before his accident. He sought a state of “no mind,” where he could exist without any awareness of his environment or his physical condition. Every day, all day at La Residencia, Hutchison practiced meditating and achieving no mind. But in the decade after this postscript was published, according to his son Galen, Hutchison’s condition deteriorated. He couldn’t walk without assistance. When, on occasion, he’d summon the strength to walk on his own, against his doctor’s orders, he’d fall and re-break his back. His condition would worsen — until it improved, and he’d try to walk again, and fall. The cycle continued for years. One morning in late 2013, Galen Hutchison received an email from the Santa Fe Coroner’s Office: his father’s assistant had found Michael’s body. According to his son, Michael Hutchison had recently started drinking again and was taking pain medication for his back. The toxicology report proved inconclusive. “I presume he probably just decided it was time,” said Galen. , “KARMA-CEUTICALS,” to find a remedy for Lisa’s stomachache. After a shot of wheatgrass juice proved ineffective, the saleswoman leads the Simpsons to a backroom with two float tanks. “Can you pee in it?” asks Homer. Both promptly sign up for two-hour floats. Homer finds the experience boring. At first, Lisa struggles to stop thinking, but soon enters the body of her cat. “Wow, my mind just created that out of nothing,” she says. “This tank is releasing the full potential of my brain.” She later becomes a tree, political journalist Cokie Roberts, and her father (who, meanwhile, sings the chorus to “Witch Doctor”). She realizes how often she forces Homer to take her to events and places, like KARMA-CEUTICALS, that he hates. Conneely characterized people on the East Coast as more skeptical than those on the West Coast, where float centers are more popular. When he re-opened iFloat in early 2012 — the first owner closed the business after a year and a half — Conneely found the small city’s “financial, kind of Wall Street, very practical” residents somewhat resistant to floating. Westport’s median household income is $119,872; the cost ($100 per float, cheaper with a monthly membership) wasn’t a hitch, but convincing people that floating wasn’t some new age fad, that it could be “practical” — encouraging them, in other words, to disregard the same preconceptions Hutchison and, to a lesser extent, Richard Feynman disregarded over thirty years ago — that took time. “Westport is becoming a financial hub, and if businesses want to have a meeting, they can come here, float and have meetings in a slower space with more depth,” Conneely’s business partner told a local paper in 2012. This notion that floating puts people people in a slower, more suggestible brain state is found on many float center websites. iFloat offers classes in John C. Lilly’s concepts of programming and metaprogramming, based on Lilly’s model of the mind as a “biocomputer.” Students are taught to identify “beliefs-in-real” — ideas about how life works, acquired in their first three to four years of life. If students find certain beliefs-in-real harmful, they are encouraged to “rewrite” them. Such training, according to Conneely, is essential for people who work at float centers. 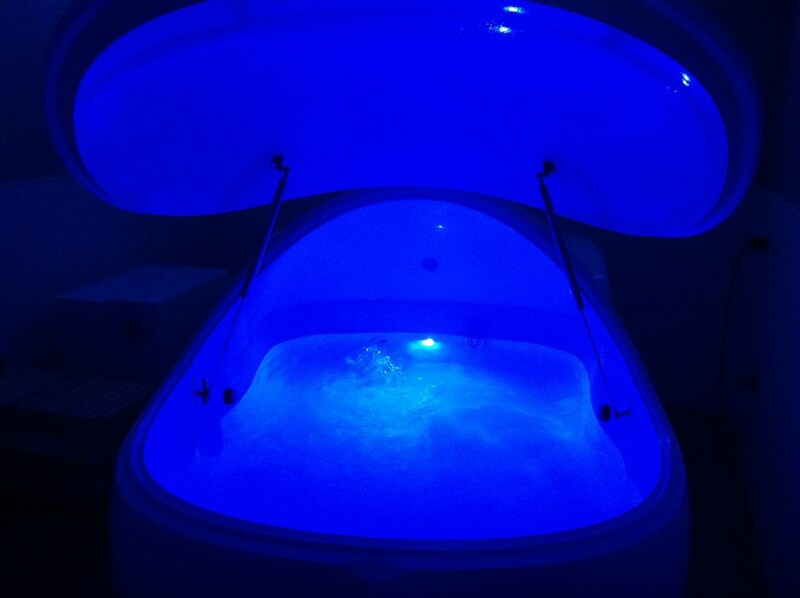 In a float center, a person who has just floated is operating in a slow brain wave state. That’s a wonderful thing. However, this slow, hypnotic state affects the people working in the float center. Many unconscious thought patterns are transferred from the float workers to the float clients and vice versa. Most importantly, the thought patterns are transferred at a slow brain wave frequency, which means the ideas can get planted at a deeper region of the mind and be helpful but also, possibly, detrimental. I Googled “float center profitable” and landed on a blog post called “Float Tanks Have a Natural Limit to Their Profits.” No matter the number of hours a center is open or the number of tanks it operates, the author argued, “there are only so many floats you can run in a day.” How, then, do you scale — or, at least, increase the profit margins of — a float center? The author listed five ways: (1) open more physical locations, (2) start a franchise, (3) design/build/sell tanks, (4) “open a neighboring, complimentary business,” like an acupuncture studio, or (5) advise other float centers. In addition to consulting services, Float Tank Solutions sells a marketing package for $370 and a business plan package for $1350. They host monthly, three-day-long “apprenticeships,” wherein up to six students learn how to build and run a float center. (Understanding water chemistry and mitigating Epsom salt’s corrosiveness are particular challenges for new owners.) These apprenticeships, which costs $2395*, have sold out every month for the past year. FTS also sells cloud-based software for float center management — Float Helm — priced at $50 per tank per month. FTS offers a free, white-label brochure for float centers: The Beginner’s Guide to Floating. As of last year, the company has distributed “over 40,000” of them. The guide features cartoony stick figures, bright colors, and non-spiritual copy. Under “why float?”, there are three subheadings: Health & Wellness (“People float to relieve stress, recover from injuries, fight addiction, eliminate chronic pain, and much more”), Meditation (“Float tanks can also be thought of as training wheels for meditation”), and Self-Improvement (“With nothing to distract you, your level of concentration and knowledge absorption is astonishing”). An illustrated section details the process of floating at a center — from arriving to floating to basking “in your post-float glow.” The FAQ section addresses fears about claustrophobia and Altered States (“only a small percentage of floaters turn into proto-human monkeys”), as well as concerns about hygiene, a perennial objection for would-be floaters. The man onstage was Nick Janicki, founder of True REST Float Spa, the first company to franchise float centers, and CEO of Float Pod Technologies, a manufacturer of float tanks. Today, with at least eight centers open or slated to open — and with twenty more queued up for 2016 — True REST seems like the center most likely to host Bieber’s first float. At the next year’s conference, Janicki pitched True REST Franchising, which launched in July of last year. “The way I see franchising,” he said to the crowd, “is as if you’re a lumber worker and you’re using a piece of floss to cut down a tree and the franchising system is a big shiny axe. And so it just gives you the tools to be able to get through the stumbling parts of the industry at first.” Forecasts on the industry in his speech’s attendant video were more explicit. “I think in the next four years we’re gonna see floating be just as popular as yoga, massage, any other modality of holistic wellness,” one employee said. When I spoke with him on the phone, Janicki echoed this prognosis. “Massage fifteen years ago was literally like in people’s basements, happy-ending kind of stuff,” he said. (A former CEO of Massage Envy — a chain of massage centers that now has over a thousand locations and, according to Janicki, was instrumental in popularizing massage in the United States — is on True REST’s advisory board.) Four or five years ago, Janicki told me, there were only thirty to forty float centers in America — fewer than the number Hutchison reported in 1982. Now, according to the Wall Street Journal in May, there are two hundred and sixty-seven. Though only one other float franchise, Float House, is registered with the Federal Trade Commission, “a couple others [are] on the horizon,” Janicki said. Janicki mentioned the fifty thousand chiropractic centers in the United States and two thousand massage centers in Arizona. If more athletes spoke publicly about floating — during the week of the Super Bowl, members of the Seahawks and Patriots floated at a True REST in Arizona — “floating would literally triple or quadruple again in another year.” Perhaps Patriots quarterback Tom Brady would supplant comedian and podcast host Joe Rogan, who Janicki credited with singlehandedly revitalizing the industry half a decade ago, as the world’s most famous floater. Janicki attributed mainstream skepticism of floating to centers’ use of “high level spiritual precepts” and “psychedelic culture” in their messaging, “which doesn’t necessarily appeal to probably eighty percent of the general public.” Although Janicki is a practitioner of Falun Gong, a Chinese spiritual discipline, True REST, like Float On, doesn’t tout metaphysical benefits of floating on its website. And soon, perhaps, each family member will have his or her own tank, and in the evenings the towns and cities will be strangely dark and quiet, and in the darkened houses and apartments, the only sound will be the muffled, gentle splashing, the slow peaceful breathing of the profoundly relaxed, the tranquil masses. It’s hard to say whether the industry remains on the or in a bubble. It seems to have floated along in this nascent state for thirty-plus years. More substantiating research, I’m told, is forthcoming. New centers are opening. Skeptical journos are publishing fulsome pieces. It might yet happen, this flotation revolution! Is it obvious to say that the fate of the industry hinges upon how American consumers allocate their health/wellness/fitness budgets? One cannot commit to every life-giving modality. Exercise or acupuncture? Massage or flotation? Maybe all these methods in my bodywork queue, if implemented, would alchemize into something fantastic. Many are privileged enough to fuss over somatic salves for discontent — but not privileged enough to do them all. *Correction: We previously listed a lower, outdated price for the apprenticeship. We regret the error.